An example of the Buyer Aggregator model is a site that pools the purchasing power of buyers who have a common goal of purchasing and receiving a discount on goods and services, and then connects those buyers with the sellers of those products and services. The Buyer Aggregator Model describes buyer aggregation as the process of bringing together individual purchasers from across the Internet to transact as a group so they can receive the same values traditionally afforded to organizations who purchase in volume. Sellers pay a small percentage of each sale on a per-transaction basis. Electronic commerce business model where a firm that does not produce or warehouse any items collects information on goods or services from several competing sources at its website. The firm's strength lies in its ability to create an environment which draws visitors to its website, and in designing a system which allows easy matching of prices and specifications. Question: What is Account Aggregation? 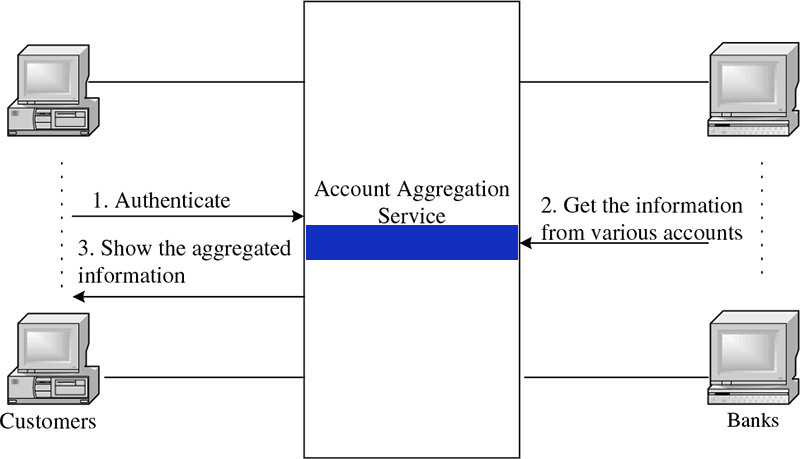 Account aggregation is a process by which information from all of an individual's accounts are collected in one place. For example, an online banking service may offer a home page in which account holders can see information from all their checking, savings, CDs and brokerage accounts in one place. Personal finance software, apps and online services like Quicken also provide account aggregation services. Account aggregation services allow users to access multiple bank accounts (even accounts from different banks) in an integrated manner via a single interface. In fact, Bank of America also provides this aggregation service. The basic operation is as shown in Figure 5-1. After authentication, the account aggregator serves as a proxy to get the information from the required banks for the user. The information is aggregated and possibly processed before being displayed to the user. Obviously, this service offers some advantages to consumers. It also presents a security issue, however, because users need to release sensitive personal information to the account aggregator for authetication purposes.